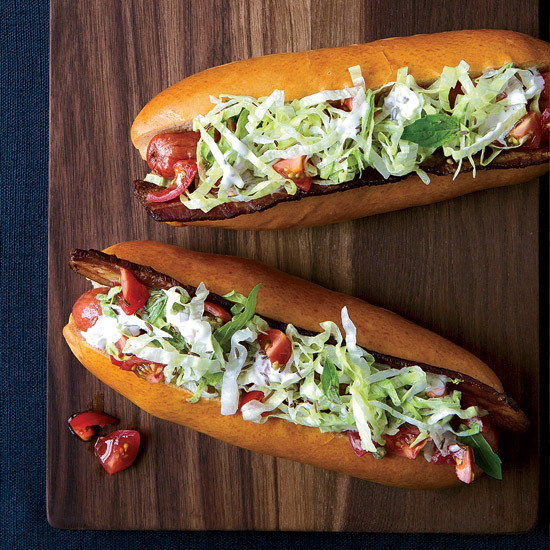 These “BLT” hot dogs are topped with crispy bacon, fresh tomatoes and crunchy lettuce dressed with a creamy caraway-pickle mayonnaise. What's even more American than apple pie? Mickey Mouse hawking hot dogs. What's even more American than apple pie? Mickey Mouse hawking hot dogs. And that's exactly what he did in his first ever on-screen speaking role. The now-famous mouse was introduced to the world in 1928's Steamboat Willie, but only whistled and hummed in his first eight cartoons. It wasn't until 1929, just as "talkies" began to take over Hollywood, that Mickey broke his silence in The Karnival Kid. In the cartoon, Mickey plays a barker at a carnival concession cart. His very first words? "Hot dogs! Hot dogs!" You don't need to go to a "karnival" to enjoy these summertime staples. To upgrade your hot dogs at your next cookout, check out these recipes.